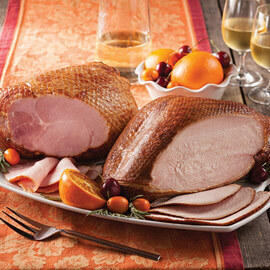 Create an elegant and memorable meal for your family with an Amana Smoked Bone-In Ham. The shank is removed and each ham is trimmed for leanness, leaving just enough fat to seal in the juices. This Smoked Bone-In Ham is mildly cured, fully smoked, and cooked to perfection. Simply warm, serve and enjoy! Servings: Our Bone-In Hams will serve 2-3 people per pound. Been buying these hams for many years they are in my opinion the best you can buy!!! Cannot say enough about the smoked bone in ham... best ham I have ever eaten... nothing like store bought salty mushy hams... these hams are so meaty and flavorful without salty taste... very pleased! Will buy again! Very possibly the best ham I have ever eaten. It also contributed to an awesome split pea with ham soup. Thank You Amana! We loved this ham. It came on time, and was high quality. We certainly would order in the future. Everybody loved the ham. Not much for left overs. I decided to order a bone-in-ham from Amana for Christmas dinner this year in 2018. I considered it a bit expensive but based on the reviews, I was willing to spend the money. I have to say that this ham was an amazing special treat for everyone and worth every penny. It was the best ham I've ever had in my life. I will order again and again. The flavor was incredible! It wasn't too salty. Also the customer service was impeccable. I am so thrilled I found Amana Smokehouse on web! Have always enjoyed the hams over the years we get for holidays. Having moved to Montana from Iowa, it is a way for us to still enjoy a part of iowa. The best Christmas ham on Gods green earth. Way back in 1979 my father-in-law received a ham as a gift from the company he was working for. We all had a Christmas dinner that day that would never be forgotten. The ham was a melt in your mouth most flavorful ham we had ever eaten. We were never able to find out where the ham came from. My in-laws past on, I have been searching for a ham that would be half as good since. I tried every butcher shop and grocery store I could think of and bought several hams a year and no matter the cost I could never find a ham that had half the qualities of the one he had. This Christmas we had planned to have 11 people over for Christmas dinner and we wanted it to be a dinner no one would forget. We polled the guest to be and they all wanted a ham dinner. Back to the internet, there were very few companies I have not tried and been disappointed by. I found Amana meats and read around 50 reviews. Out of 50 reviews I did not find one review under 4 stars. Hopeful I ordered a 15 lb. ham bone in. The ham arrived two days before Christmas, when I opened the box you could smell the smoke like you just walked into a smoke house filled with fresh hams. I cooked the ham according to the directions that came with the it. When I took the ham out of the oven and started to carve it, the bone fell right out with no effort at all. Between the aroma and the tenderness of the meat I knew we finely had found a ham that was just like the one my father-in-law had years ago. I was "wrong" The ham that came from AMANA was a 100 times better than the ham my father-in-law had all those years ago. I put nothing at all on the ham before cooking. Everyone of our guest myself and my wife could not believe how great the flavor of the ham was and how you could cut it with your fork. When you put it in your mouth it just melted. After all the years of searching for the best ham you could ever ask for, we found it. Everyone agreed this was the best ham on gods green earth. You could never ask for anything better, perfection can't be beet. We will never buy a ham from any other company. AMANA is the only company we will order from in the future. Thank you for making Christmas dinner the one meal we all never will forget!!! Amana Response: Thank you so much, Garry! I am so glad you and your guests enjoyed our ham! We look forward to helping you in the future and promise to keep up the good work of providing excellent hams for you! The ham was delivered in two days and was some of the best ham I have ever purchased. Will definitely reorder. The ham was very good. I was very impressed at how little fat there was on the ham. The only drawback for me was that the smoke flavor was a little too strong. All I can say is: Excellent! Excellent shipping. The ham was excellent in quality and the taste was superb. Will buy again. The ham was perfect, just as we expected. It arrived right on time. As a first time customer I was very pleased with the service and the delivery . The ham may be the best I have ever cooked and eaten. I will order again. I ordered a ham for Easter and it was the best ham we ever had!! I ordered this ham for Easter. We all loved it, it was wonderful. We haven't eaten the bacon yet. We love our ham and have all been disappointed year after year even though we purchased expensive hams. This year I ordered one from you and it was everything you and your customers said it was. We will be ordering another next year. Thank you! Worth the high price per pound, (this year)! This year we splurged and purchased a 15-pound Amana Whole Bone-in Ham for our Easter Dinner for 29 people to accompany my Maryland Crab Cake Casserole (we live in Baltimore blue crab country). I dry rubbed the ham with black pepper, garlic powder, and dry mustard, baked it at 325 F. to a 140 F. internal temperature, and finished it with a spiced honey glaze for 30 minutes. The ham was EXCELLENT at dinner next to the lovely crabmeat, but the leftover low fat medallions of sliced ham might be even more divine!! I'll try to make sure we can afford Amana's ham next Easter! We enjoyed another delicious Amana Bone-in Ham for Easter dinner. As always, it was the best! BEST TASTING HAMS AND SMOKED PORK CHOPS YOU WILL EVER EAT. JUICY AND TENDER. WE WILL BE ORDERING FROM THEM AGAIN IN THE YEARS TO COME. Excellent bone in ham along with the best customer service around! We ordered a ham for our family Christmas gathering. It was delicious--moist and flavorful. Thank you! Remind me of the ham my Grandfather made back in the 50s. I'm Australian and I've eaten a lot of Ham in my time and it's one of my favorite meals (not to mention the soup I always make with the bone). Who says you have to limit it to special holidays in the Year ???? I won't be any more after discovering Amana Hams. It didn't last more than a few days, finding it's way on the table for the initial meal and every chance thereafter. I'm about to order another one as my Partner was unable to spend Christmas with me and we've officially moved Christmas to January 7. She will love it too. Outstanding product. I will be a recurring customer through 2018. We are never disappointed with the ham. Perfect every time. 10th Christmas. Always fabulous smoked ham. Looking forward to many more. Thank you folks. We all really loved our Christmas ham from Amana. It was moist and very flavorful. Will definitely purchase again. The best ham we have had ! We served the Amana ham at a family Christmas party yesterday. It was perfect everyone loved it. Also made wonderful cold sandwiches later. We will be getting this again. It has been a tradition that your ham is the main dish at our holiday celebration. One year we could not serve this ham, and everyone was greatly disappointed! For our annual family Christmas party, my contribution is always your delicious Amana bone-in ham. Everyone loves it. I especially love the leftover bone and ham to make Ham and Bean soup. Great product. THE HAM WAS A GIFT FROM FAMILY ,AS MY WIFE WAS IN HOSIPITAL,IT WAS BEST HEATED IN MICROWAVE THAN IN OVEN I HAD SEVERAL HAM SANDWITCHES..WAS GOOD AND SOFT NOT DRY OR HARD. WELL MADE. Great process for ordering and delivery of ham for Easter Dinner. I warmed it on my barbeque (indirect method) with a inch of apple juice in the pan and glazed it periodically with a apricot preserve/soy sauce mixture. The results were outstanding and easy for a holiday meal. The kids all headed home with leftovers and the bone was used for ham bone soup. Will definitely order again. Thanks. Amana Response: Wow! That sounds really yummy! We are so glad we were a part of your Easter celebration! The ham was absolutely delicious! Very moist and soft. Easy to slice, too. More than plenty for a group of 8. Highly recommended it! Best tasting ham ever...I have given as gifts and have all my fam and friends ordering.....we went to Dallas to my brothers and he said ...Guess what we have Amana ham we couldn't forget how good it was at your home. Your bone-in smoked ham has the best flavor ever! It also is moist and tender. Thank you for never disappointing!! We always order our ham for Christmas and Easter from the Amana Meatshop & Smokehouse. 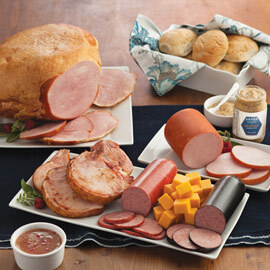 We are always satisfied with the highest quality ham and delicious taste. Our order is always accurate and arrives on time. Thank you! I've been ordering hams from Amana for years. They are simply the best ever. Always so wonderful and flavorful. You can't go wrong with an Amana ham! For the third year in a row our family ordered a ham from the Amana meat market. For the third year in a row we had the best ham we've ever eaten. You simply can't go wrong purchasing one of these hams... too salty incredibly lean and worth every penny. Thank you for making our holiday dinner special. The ham was very tender and tasty! I followed the cooking directions and it was(gone now), a very flavorful ham. We wanted to tell everyone "our ham was the best we've ever had"! I called your *helpful* customer service wondering if our ham would arrive Christmas Eve... We did receive the ham, and very thankful. Merry Christmas & we plan on ordering more of your #outstanding products in the 2017 New Year. First time ordering from Amana. I had ordered hams from other vendors in the past. The ham was excellent. Nice flavor, lean, and tender. Clearly from well raised swine. I hadn't had ham this good since I was a kid and we raised our own pigs. In addition, the shipping fee was quite reasonable. I added in some bacon (also excellent) and some sausage ( not yet tested). This was a very good deal as there were substantial savings when adding these items along with the ham. I shall be returning. Amana Response: Thank you for your comments, Tom! We look forward to serving you for other holidays and occasions. Our building owner provides hams for our December Pot Luck, I as the manager have to warm & slice it up. This year they got 2 of your 7-9lb bone in hams. We fed about 35 people with enough left over for several to take plates home. I heard comments like, it's so tender it melts in my mouth, and it wasn't too salty, as well as very moist. We appreciated how delicious the hams were and hope Amana hams find their way to our tables next year! This is the second year I have ordered the bone in hams. Great gifts and they are the best tasting hams I have ever purchased. This ham I ordered was the best I have had in along time. It beat the grocery store hams hands down. It is a little more pricey but well worth the extra cost. This ham is probably the best I have ever had. I've ordered it a couple times and it is constantly great. There are just two of us at home but I find a way to use it all happily. Great service, great product. I ordered a bone-in ham for our Father's Day meal. My son in law grilled it and added a honey glaze at the end. It was moist and mouth watering. Everyone enjoyed second helpings (and a few thirds)! We received lots of compliments on the dinner and questions about where we got the delicious ham. Still the very best dinner ham (pretty good for breakfast too!) to be found. And great customer service too. It's an unbeatable combination. Please, please, keep it up!! This was the first year trying an Amana ham. We have to say it was outstanding and we will order another next holiday. Our Amana ham was perfectly smoked, juicy, tender...just perfect! OMG best ham I have ever fixed or eaten! It melted in your mouth. Also all ham-no waste. Amana Response: Thank you for your comments! . Way to go, Grandma, for always making the best ham! well balanced smoked flavor. The idea of providing a bone-in ham with only the top round attached is fascinating. We and our guests enjoyed it thoroughly. My family has tried so many smoked hams in all the catalogues that we get. Amana hams are by far our most favorite - perfectly smoked, lean and so flavorful. We bought two of them this time! Cannot comment on the ham we purchased because it has not arrived yet. However, your brochure certainly presents your products in the best way possible. Easter is when we will enjoy the ham ! Amana Response: Your Amana Ham is on the way! Enjoy with your family for Easter dinner! Have previously ordered hams as well as pork chops and bacon. All products are perfectly shipped in a timely fashion. Better yet, the taste is wonderful. Many orders to follow. Amana Response: Thank you! We always enjoy assisting you and shipping you our Amana products! Absolutely great not salty, can really taste the real Ham flavor, just mildly smoked, the whole family loved it. First time orderer, and I will place future orders. I always get my ham from out of state, but this bet them all. Very lean, not dry, not salty, nicely smoked,and perfect. Thank you for the great meat and great service! Outstanding Ham, delivered on time. Our holiday bone-in Ham was delicious as always. Fabulous and enjoyed by all. The best tasting ham I ever ate. Flavorful and juicy. Would recomend to all. I have ordered this ham before, but it continues to be a great product. Wonderful flavor. HAVE HAD THIS HAM PREVIOUSLY AND WAS VERY PLEASED WITH THE QUALITY. EXPECT THE SAME FROM THIS ONE. This ham is our Christmas tradition. It is by far the best ham I have ever tried. We can't imagine Christmas dinner without it! I have purchased COOKS ham for years and it was very good but does not compare with the goodness of the Amana ham we had for thanksgiving. I have ordered this Ham every Christmas for years and years. It is always excellent and everyone who tastes it is amazed at just how wonderful it is. You can never go wrong with this ham. ALTHOUGH MEAT WE BUY SAYS FULLY COOKED, I STILL BAKE IT IN THE OVEN-AS A MATTER OF FACT, I COOKED IT ON LOW ALL-NIGHT, LET IT COOL, SLICED SOME OFF AND THE REST MY HUSBAND AND I MADE HAM SALAD. IT WAS OUTSTANDING, THAT WAS THE REASON FOR THE PURCHASE SO WE COULD HAVE SOME GOOD HAM SALAD AND IT WAS. WE WOULD BUY IT AGAIN! This is the best ham I ever had. My family owns a small grocery store and may want to carry your products. Do you offer wholesale pricing for large orders? Amana Response: Glad you enjoy our Amana Hams, Mark! With higher quantity levels, we may be able to offer more of a "wholesale" price. Feel free to contact us directly at 800-373-6328 or email us at info@amanameatshop.com with your questions and interests. Gave to friends for an Easter gift and they said it was "superb". This is the best ham we've ever tasted. Tender and flavorful. Excellent quality I'm proud to serve. Absolutely fantastic ham!! Not salty, perfect smoked flavor. Will buy one again for holiday dinner!! Amana Response: Thank you, Joel! Let us know when we may help you again! Wonderful small bone-in ham. Family raved! This the best tasting ham I think I have ever eaten. Try one and you won't buy another brand. And the bone makes the best ham and bean soup! Thanks for a Great product. We have served several of the Bone-In Hams for friends and relatives. Everyone always comments on how delicious they are; flavorful, smoked to perfection, and not salty. So far we have not found a superior ham, in fact, why bother trying. This ham was absolutely fantastic, very tender and great flavor! A little over 9 lbs and not a huge bone using up that weight. We always have the smaller bone in ham for easter and sometimes Christmas, too. It always turns out perfectly. I fed five and sent home leftovers. I have plenty left for us and the bone will make an amazing soup. A great way to feed a group. Best ham around! My family would not eat any other. Always the meat of choice for any occasion. The meat is always wonderful and everyone enjoys it a great deal. I will continue to order. Thank you for excellent ham and bacon. Amana Response: Thank you for being such a loyal customer. We appreciate you! we have not received it yet, but if it is like last year - yummy. Ham is just outstanding. Stuffed pork chops always the best. Ham was more affordable than most and declared by all as the best they had ever tasted. At family holiday dinner, even most critical adult and pickiest child asked for more of this ham (12-14 lb. bone-in). The Amana ham arrived very quickly and was served for Christmas dinner. Everyone loved it's flavor. A little chicken broth in the bottom of the pan is all it takes. This ham cooks up tender, juicy and smoky - you can't stop from picking apart your dream pieces before serving it to your guests. Absolutely delicious! My family had your ham on thanksgiving but we didn't take leftovers home. We usually have prime rib for Christmas but everyone requested ham! Always the best! Flavorful, juicy, delicious ham. Loved it on Christmas day, and will love it in sandwiches, soup, and snacks for a few days to come! Every one loved your ham. This was a great ham. Mild and juicy. Will definitely order again. My family received their ham and were very excited. The hams are always perfect! No one in our family can resist the ham. 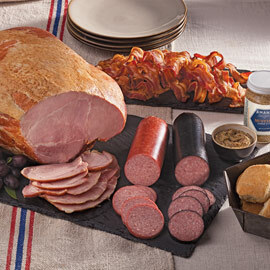 No one has to ask where the ham comes from around our table they know it could only be a Amana Ham!! I order the Amana Bone-in Ham every Christmas for my brother and family in Dallas, TX. They said they have never tasted a better ham and always am glad I send them one. They serve it to the whole family. Thank you Amana for offer your great food. I also enjoy visiting you in Amana. and, it was better than we had hoped. Arrived fast, ready to eat. Just a quality ham. They also have a variety of other meats. Highly recommend! We will be ordering again. I'm the cook in the family. My wife is the critic. If she likes it, it is really good. She said it is the best ham she ever ate. Nuf said! I'm happy if she's happy. The ham we purchased was absolutely the best. Never had a ham so lean and taste so good. Thanks! Amana bone-in hams are the best of the best of hams. The meat is smoked just right, the flavor is not too salty and super-tender. The secret is (and this is probably true for any ham) is cook "low and slow". But you will not find a better ham at any price. I would recommend this product, and all Amana Meat Shop products to anyone with confidence. Delicious, smoky/sweet, flavorful, tender. I ordered this for my husband, a pork-lover. Both of us love the Amana bone-in hams. I had not even liked ham for many years pre-Amana. My friends in Nebraska sent this ham for Christmas & it is the very best one we have ever had bar none. Amana Hams are fully cooked and ready to eat. To serve warm: if frozen thaw in refrigerator, remove packaging and place on a rack in a shallow pan or roaster with a small amount of water. Cover with foil or lid. Place in a pre-heated 325° oven. Bake approximately 14-15 minutes per pound, or until the internal temperature reaches 135°. (You may bathe the ham with liquid from the pan during the heating process.) Remove foil 3/4 the way through the cooking time so browning can occur. Basting with your favorite sauce is optional. We recommend our Horseradish Jelly - delicious! Call to order. Hams may be stored in the freezer in their original packaging for up the three months.